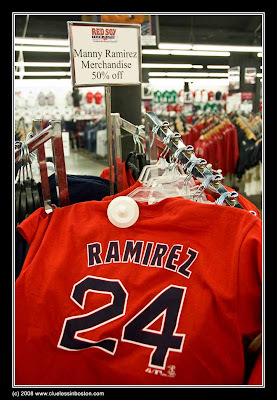 The Red Sox gift shop has reduced all Manny Ramirez shirts, etc. by 50% now that he has been traded. Now that he's gone everyone wants to forget him as soon as possible it seems. What is the name of the Green Bay Packer quarterback. Hum. He was traded. Their icon is gone. I suspect it might be the same with #24. Maybe they should have been reduced sooner?